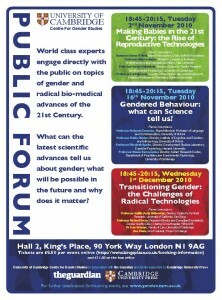 Each forum will be held 18.45 – 20.15 in Hall 2, King’s Place, 90 York Way, London N1 9AG. Tickets are £9.50, and available online here. This entry was posted in Feminism and Science, Feminism and Technology, Reproductive Rights, Upcoming Lectures. Bookmark the permalink.